Derek October 14, 2012 October 28, 2012 1 Comment on P.I.D. Radio 10/14/12: Who Goes Under the Bus? Both parties seem willing to let the other do the honors. Elsewhere: Turks and Syrians edge closer to war; Sen. Arlen Specter dies; Barack Obama’s “no god but Allah” ring; BBC film crew detained at Area 51; and the Brits develop anti-alien weapons. Shema Yisrael, Adonai Eloheynu, Adonai Echad. Hear O Israel, the Eternal One is our God, the Eternal One alone. The very next verse is, “And you shall love the Lord your God . . .” Yeshua quoted both the Shema and the next verse together when asked what the most important commandment is in Mark 12[:29-31]. From that I would argue that the Shema is not only the most important creed in Judaism, but that it should be to Christians as well–and that if a Christian were to have it on a ring (and I know several that do) that it would not be a problem at all. The problem with a Christian wearing or stating the Shahad, even if it doesn’t contain the second clause regarding Mohammed (and in this case, I’d want to see the inside of the ring’s band) is that in Islamic theology, Allah is not only a general word for “God,” but is also the personal name of the God of Islam, in opposition to the Tetragramaton, which is the personal name of the God of Judaism and Christianity. Therefore to wear it or say it is to declare that there is no god but the one proclaimed by Mohammed–whose personal attributes as described in the Quran are precisely opposite of the God of Abraham, Isaac, and Jacob. 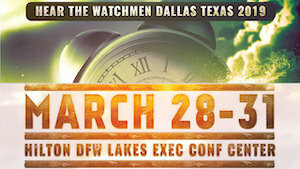 Details on Future Congress 2 January 4-6, 2013 in Dallas are available here.